Pani puri is among the most popular forms of chaat available on the streets of most Indian cities. There are different names, different flavours, different ingredients given to pani puri, depending on which geography it traces its roots to. Most of Bangalore’s pani puri bhaiyyas come from Allahabad, though they have often been all over India before making their current stop in Bangalore. This reflects in their offering – some are influenced by the puchkas of Kolkata, while others reflect the gol gappas of Delhi and yet others are closer to the batashas from UP. Here are 7 of Bangalore’s most popular Pani Puri stalls. Among the most popular pani puri stalls, Ramraj’s pani puri is clearly closer to the puchkas of Kolkata. The pani is perfectly tangy and the puris are crunchy. The potato stuffing has the right ratio of masalas. Even the sukha puri is well done. 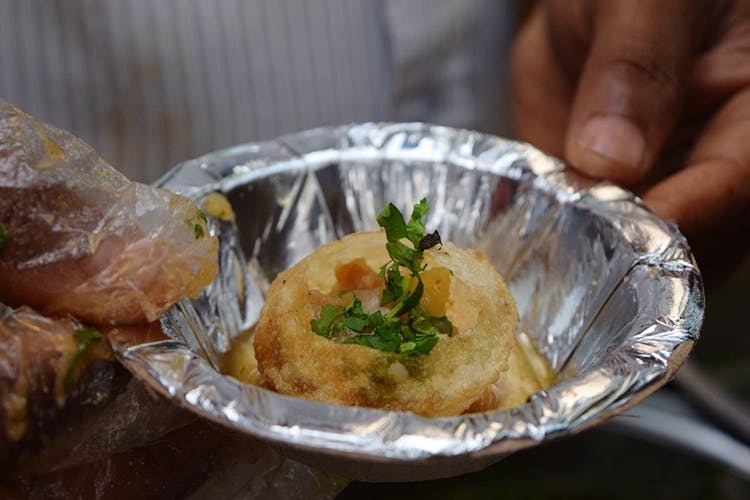 The Pani Puri stall outside JNC College is a much-loved haunt of the JNC students who are usually crowding around the stall. Though there are other pani puri stalls in the vicinity, this is the one that draws maximum crowds for its perfect puris, aloo stuffing and pani. Anil Kumar’s stall on New BEL Road has a huge following among the MS Ramaiah students and that’s why it is part of this list. Eleven years old, he has mastered the art of serving the most delicious pani puris day after day. The pani has a hint of coriander and fresh mint apart from the spices and will beg to be had on repeat. One of the oldest pani puri places in the vicinity, Rakesh Pani Puri and Chaat serves authentic North Indian Chaat. Started in 1994 by Mr Rakesh, who hails from Benaras, this outlet is best known for its Pani Puri and Alu Chaat. ‘Do you look at the tree that stands here?’, he asks me, pointing to a tree in front of the outlet midway during the conversation. ‘I had planted it twenty years ago, when I first set the shop here!’, he says, with a smile that resembles a proud parent’s. With many colleges and other institutions located nearby, this place is highly popular for its chaat, and one seldom finds the outlet without customers. This 25-year-old street cart is best known for its Karnataka style chaat and pani puri in Vijaynagar. Started by Mr Manju and his wife, this cart has customers in all age groups, including families that have been enjoying chaat here since its initial stages. The menu is simple, like all other chaat carts – Pani Puri, Masala Puri, Sev Puri, Bhel Puri, Dahi Puri, etc – but what makes this cart different is the fact that the taste of the dishes served here is said to have hardly changed since the beginning. Popular for its ‘White Pani’, Shree Chat Point is located on the 3rd Block, Jayanagar, Bangalore. White Pani, which seems to have its origins in Andhra Pradesh, serves as a substitute to the tamarind based Pani that usually accompanies the Puris on a regular Pani Puri plate. It is made out of de-seeded green chillies – which result in a tangy taste that is similar to the normal tamarind-flavoured pani. Sweet Moments is as well known for its sweets as it is for its chaats. Head here for authentic North-Indian chaats including recommended pani puri. The post first appeared on Talking Street. Read the full post here.